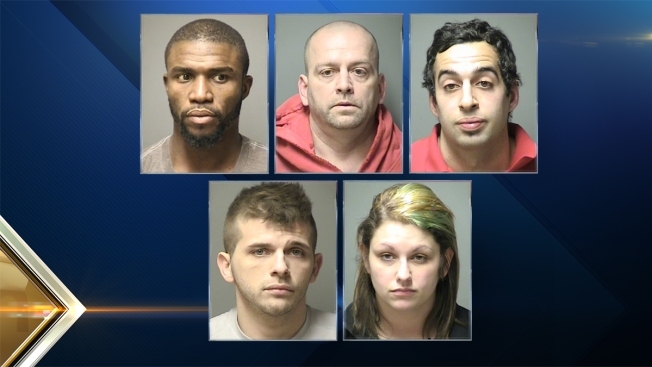 Five people were arrested in a drug sweep overnight Thursday in Manchester and Hooksett, New Hampshire. Five people were arrested, and methamphetamine, marijuana and cocaine seized, in a two-city drug sweep in New Hampshire overnight Thursday. Manchester Police said Operation Granite Hammer resulted in three arrests in Manchester and two arrests in neighboring Hooksett. Overall, 7.5 grams of methamphetamine, 15 grams of marijuana and 0.5 grams of crack cocaine with a total value of $1,840. Senesie Bai, 33, of 92 Walnut St., Manchester, for possession of cocaine. He was scheduled to be arraigned on Friday in Manchester District Court. James Hedberg, 44, of Manchester, on a warrant for being a habitual offender. He was released on $100 bail and is scheduled to appear in court on March 14. David Azzo, 24, of Manchester, on a warrant for sale of a controlled drug. He was scheduled to appear in Manchester District Court on Friday. Travis Leavitt, 28, of 5 Skyline Dr., Hooksett, for possession of illegal drugs. He was scheduled to appear in Manchester District Court on Friday. Desiree Badaoui, 26, of Tyngsboro, Massachusetts, for possession of illegal drugs. She was scheduled to appear in Manchester District Court on Friday.